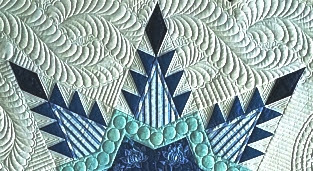 I pushed the send button on entering Featheration 2Blu into two overseas quilt shows this week. After the trying time of my mother's passing I thought it appropriate to honour her by furthering the journey of my quilts. I will not find out until 6 weeks before the shows, if I have to send it overseas. Because of the number of quilts entered they Pre Judge entries so my fingers will be crossed. My husband and I were going to make the trip overseas to visit the quilt shows and tour the USA, however, the notification he couldn't get extended time away from work, my mother's passing and the invitation to a nephew's wedding in Hawaii all happened within a 48 hour timeframe. So I will send her alone and watch her journey on social media. A trip overseas to visit quilt shows will come my way someday. Sorry to read about your mothers passing Lyn. Best wishes for your entries into the overseas quilt shows. It is a big step.